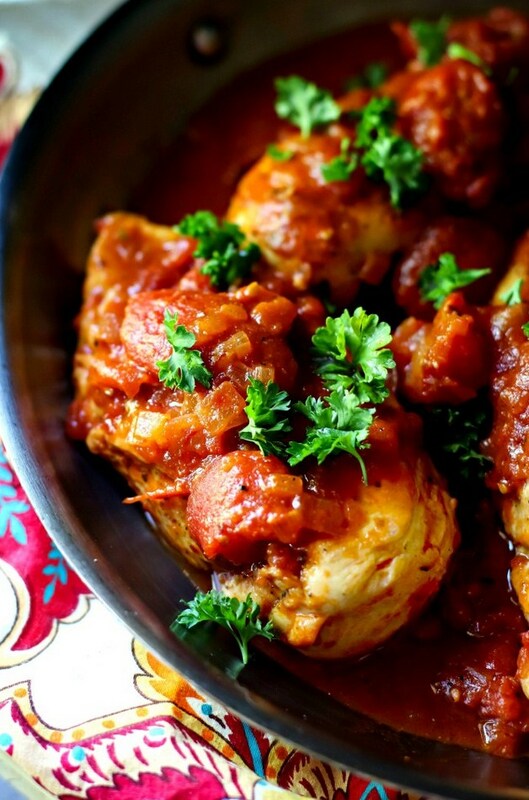 Skillet Tomato Chicken Breast Dinner - I love bringing you easy delicious recipes like this. You will be absolutely amazed at how something so simple could be so delicious! Salt and pepper both sides of the chicken breasts. Place the olive oil in a large saute pan. Saute the chicken breast until golden brown on both sides. Remove the chicken breasts from the pan to a plate. Add the white cooking wine to the pan and deglaze it. Add the onions, chicken broth, tomatoes,garlic powder, and sugar to the pan. Simmer for 10 minutes. Place the chicken breasts back into the pan, spoon the tomatoes on top of the breasts, simmer for 15 minutes or until chicken is cooked through. Serve immediately.